Vivekananda Kendra Nagpur Branch organised 2 YOGA SATRAS in February 2017. One satra was organized at 26 Atre Layout (11-02-2017 to 20-02-2017) in the morning 6 to 7.30. Total 12 candidates participated in this satra. It included practical training of Loosening Exercise, Surya Namaskar, Aasan, and Pranayam. Pranayam satra which was organised at Raviram Residency Dhantoli (13-02-2017 to 19-02-2017) in the evening 5 p.m. to 6 p.m. 19 candidates participated in this satra. 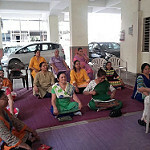 It included Practical training of Loosening Exercise,Breathing Exercise and Pranayam.